I've been busy for the past week playing with my newest toy, a Wacom Bamboo Fun! It's not the big tablet that I'd like to have one day, but it's a great first step, and it's made designing new vinyl decals insanely easier. I've got a whole bunch of new, hand drawn vinyl designs ready to add to my decal store. When I first began Stickerella it was just a side project that allowed me to have my own vinyl cutter, and let me help other Etsy sellers make custom URL decals to advertise their shops at low prices. I've helped a lot of people make custom decals, and I've really loved interacting with all of my fellow Etsiers, and to be honest, the vinyl machine has kind of grown on me (think Akira :P). One of my new year's resolutions was to completely revamp Stickerella, and bring it up from a secondary project placing it side by side with my studio shop. David and I talked quite awhile about the direction I'd like to take the shop. In the end, I decided to make it something truly me. Decals will be Fantasy, Sci-Fi, Horror, Gaming, Medieval, Religious, and of course, Crafting themed! I'm still very happy to work with Etsy sellers to design affordable custom decals, since I love working with other sellers. I'm still working on art, still working on Alice, and definitely still working on my wedding, so no worries about this replacing any of those things. I plan to start posting new designs on the 26th, and will have some fun giveaways and stuff planned as well! cool blog! I just found your blog. 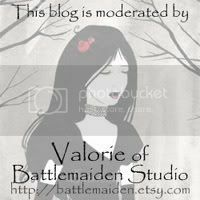 Come and visit me and my children art blog. Support my boys and help them to produce good artwork. Your kind comment will help them to build their confident and motivation. Your artwork too could be their inspirations.